I believe it is fair to say that Benjamin Fadi of Heart of Lions FC is one of the most exciting strikers in the Ghanaian GLO Premier League. Fadi, who finished his first ever season at top level with four goals, is in top form and is currently starring for the Black Satellites, the Ghana U-20 national football team. In March 2012, Fadi was named in the squad of the Ghana U-20 national football team for the first time. Since then, he has cemented his place in the squad. 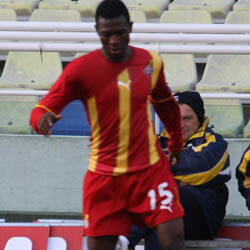 In May 2012, Fadi was part of the Ghana U-20 team that participated in the Cape Town U-20 International friendly tournament. Fadi scored the winning goal in the opening match against Nigeria, his only goal of the tournament. The goal was apparently a close range finish. Earlier this month, Fadi played for Ghana U-20 in the so-called 2012 Accra Three Nations Cup. Fadi scored against Namibia on 08.07.2012 (a header) and against Egypt on 12.07.2012 (a penalty goal). Currently, Fadi is at a training camp with the Ghana U-20 national football team. Later this month, the Black Satellites will play against Uganda in a qualifier for the African U-20 Championship, to be played in Algeria in 2013. A few days ago, Fadi scored in a practice match against Ghanaian second level team Eleven Wise FC. Fadi is obviously in great form and will most likely lead the attack against Uganda. Fadi is a great talent and a surprisingly physical player for such a young man. He is strong as a bull and holds up the ball well, creating space and opportunities for his teammates. Fadi works hard, even in matches where he has been hopelessly alone up front, facing rugged central defenders. I have seen Fadi play a couple of times and if he works hard with his finishes, I think he could have a wonderful career. After the 2012 Accra Three Nations Cup, Fadi was linked to top club Hearts of Oak SC. Personally, I think Fadi could benefit from playing at a club who creates more chances than lowly Heart of Lions FC. The picture of Fadi was found on img.myghana.tv. He’s still in Malmo. Saw him today at training. Malmo coach likes him. One week later, he’s moved along to Werder Bremen, Germany. Problem there is, he couldn’t play in their second squad due to license restictions of non-eu players. He’s in Malmo, Sweden right now. He is doing great at training, looks very strong. Maybe they will try and recruit him? They (Malmo FF) already have one African player as a striker – Tokelo Rantie from South Africa.